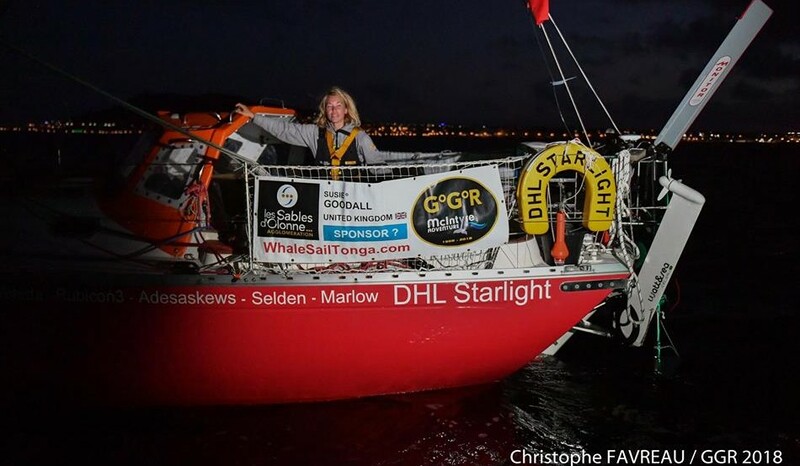 British yachtswoman Susie Goodall remains safe and secure aboard her yacht DHL Starlight after being pitchpoled and dismasted in the Southern Ocean some 2,000 miles west of Cape Horn Wednesday. Susie remains in regular contact with Race HQ and will spend today preparing for evacuation tomorrow. The flooding is now under control, and today she will endeavour to coax DHL Starlight’s engine to run again in case she is required to manoeuvre her yacht alongside the ship. She will also ensure that the yacht’s liferaft is ready to deploy. It will still be dark when the MV Tian Fu reaches the scene and the rescue operation is unlikely to commence before daylight. It will be for her Captain to decide the best method to transfer Goodall from yacht to ship. This could entail launching the ship’s own man-overboard vessel, or lowering a cargo net or ladder over the side for her to climb up from the yacht or her liferaft.